I have to admit that I'm a podcast junkie. And it's not a new phenomenon. My love for radio and talk shows goes back to my college days. I used to rearrange my schedule so I could listen to my favorite show. In my 20s, when I started working full-time, I made sure my lunch coincided with the New Life Live broadcast so I'd never miss a show. These days, I listen to podcasts while I'm making dinner, at work and during my short commute to and from work. I just love the wealth of information I can get from podcasts. Inspired to Action: Great podcast for resource and inspiration for mothers. Always a good show filled with practical information that I can put into practice right away. Revive Our Hearts: I love the sweet way that Nancy Leigh DeMoss imparts God’s Word to listeners. Always something encouraging and even when it’s convicting, it’s still helpful. The Portfolio Life: I’ve been reading Jeff Goins' blog for a while, but recently started listening to his podcast. Good solid, information for writers and just some uplifting messages for life in general. He says his goals are to help listeners: 1) Find the work you were born to do. 2) Identify what makes up your portfolio. 3) Get started creating it. The last podcast, The Importance of Being Your True Self really hit home. Homeword: Jim Burns’ broadcast has been a favorite of mine for years now. The tagline for his site is: Helping Families Succeed and he does just that with subjects like Parenting Tech Savvy Kids to Being the Parent Your Kids Really Need. I always look forward to this podcast. Compass Money Wise: This show is an extension of show I used to listen to back in my single days. Solid and biblical financial advice from Howard Dayton & Steve Moore. FamilyLife Today with Dennis Rainey: This one really should be on my favorites list because I listen to it all the time and enjoy it immensely. They always have the best guests who offer encouragement for marriage and family issues. Focus on the Family: This is another oldie but a goodie that I have listened to for years (back when Dr. James Dobson was the host). Always timely advice as it relates to family matters. Marriage Today with Jimmy and Karen: I used to watch their television broadcast, but when I found out about the podcast, I switched to that. Marriage advice from a couple who’s been there and back. Dr. James Dobson's Family Talk: Family talk with wise counsel. Passion City Church: Louie Giglio is one of the best communicators and pastors out there in my book. The Goliath Must Fall series has been my favorite thus far. Building Relationships with Dr. Gary Chapman: A podcast offering insight and advice for relationships of every type. Grammar Girl Quick and Dirty Tips for Better Writing: This one is for the writer geeks and wordsmiths of the world..like me! This is Your Life: Michael Hyatt is an innovator who has a knack for lighting a fire under listeners with his practical, hands-on advice like How To Do More of What You Love and Less of What You Don’t. Achieve Your Goals with Hal Elrod: Sorta new to me podcast but I’ve enjoyed what I’ve heard thus far. Do you listen to podcasts? If so, I’d love to hear what’s in your ear. If not, what kind of podcasts would be interested in listening to? Enjoying: Our current SoCal heat wave. It is currently 93 degrees as I type this at 12:09 p.m. I know everyone is ready for fall but summer attire is my favorite. So not ready to put away the sandals and sundresses. Feeling: Nervous about andenoid/tonsil surgery six year old has to have over Thanksgiving break. For a few years now, we have noticed he always sounds very congested. Got him tested for allergies. All clear. Last year his adenoids got checked and they are too big. Medicine hasn't done much to shrink them. A new check up reveled his tonsils are enlarged as well. Whenever I get anxious, I pray for the doctor who is doing the surgery and that God will cover our son. Reading...: HomeFront Magazine: A spiritual parenting resource. Stumbled across this magazine recently and fell in love. Great ideas for sharing the Word of God with kids. I read the first copy I got cover to cover. Very inspiring and informative. Wanting: To take a road trip home to Northern California. It's been a while since I've driven up with the kids. My mother reminds me weekly that she misses her grandkids. Not feeling a six hour drive with all three, but then again, it's not a six hour plane ride so...there's that. Listening to: Kierra Sheard's Graceland. I LOVE this album and so do the kids. I mentioned that feeding them good music is a priority and this one delivers. I've recently had to draw the line on some music for them. It's good that I could provide an alternative that doesn't make them miss what was denied. Repin My God is their favorite song. Watching: The Biggest Loser. Six Little McGhees (yes! we are still cable-less). And Teen Mom 2 (my guilty pleasure). I have a post in my drafts folder about life without cable after more than a year. I need to finish that up. I wish this was the post where I was doing the reveal on my Pinterest Monthly Project. However, a stomach virus knocked my flat off my feet recently so it got pushed to the back burner but it will be up soon. I did, however, manage to create another mini project for myself. Life with three kids is driving me batty because my brain can't hold all the information required to rear them correctly. I found many things falling through the cracks with my purse full of post it notes with reminders, to dos, and bits of info. When I got my iPhone four years ago, I ditched my planner because my iPhone held everything. Lately, it just hasn't been working for me. It's so easy to snooze a To-Do list that pops up and then forget about it completely. And truth is, I'm really a pen to paper girl at heart. I was all set to make my own planner and have it bound at Fe.dEx K.inkos because the store-bought planners didn't have what I needed. But I wasted all the printer ink when I printed the calendar pages for my planner wrong. Boo-hoo! Had to set Plan B in motion. 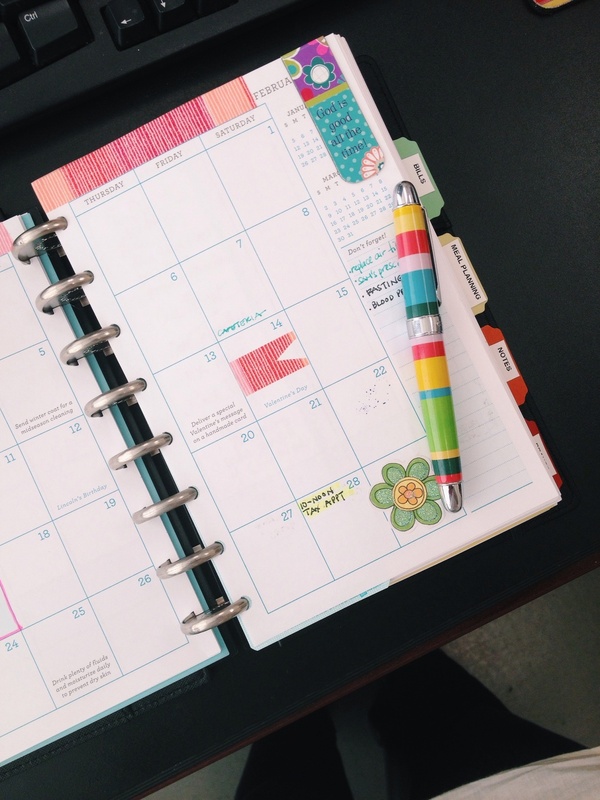 I did a Google search and discovered there's a whole community of planner addicts out there. Let's just say I'm officially hooked now. I'm two weeks in and still working on customizing it to my liking, but already my brain feels lighter. I settled on the Martha Stewart Discbound Notebook (6.5 inches x 9) because the pages can be moved around easily without dealing with binding and such, the price was right at $18 and it fits perfectly in my purse. I was torn between that and the Arc customizable notebooks which come in leather and multiples colors but Martha won out because it had a built in elastic closure and seems like it will survive the scratches it will endure being in my purse. So far I have sections for Calendar, Bills, Meal Planning, Goals, Projects and Prayer. I already see that I'm going to add a few more sections I went ahead and bought the larger disc because I knew I'd have many pages--so glad I did. So now every single thing gets written in my planner: school projects for the boys, every single school event, who eats in the cafeteria on what days, errands to run, everyone's appointments, ideas for blog posts...if it crosses my mind, it now gets written down. And being the stationery addict that I am, I'm already looking to upgrade to a Filofax or a kikki-K.
Of course, I still use my iPhone for appointments and Siri reminds me of lots of things but my planner is my new go-to for to-dos. I fell in love with blogging when I started my first blog, The NON-Superwoman Chronicles, in 2005. Most of the blogs I read were people who also loved blogging for the sake of blogging. It's safe to say that every member of our little family is currently in the midst of a major obsession. It all started earlier this week when the five-year-old asked me to turn up Radio Disney because his favorite song was on: Replay by Zendaya. Turns out the kid has good taste, I was soon hooked on the song too. Later that night, he asked me to find the video on Vevo. Surprisingly the video is awesome--thanks to the choreography. It was so good that I turned to Google to find out who the choreographer is. A 20-year-old choreographer from Chicago who was a rising star on season 7 of MTV's America' s Best Dance Crew..among other things. For the past year, I’d been contemplating cutting cable. DirecTV is expensive, even after downgrading to the lowest package and only having it on one TV. That alone is more than $50 a month. I was also frustrated that we only watched a handful of channels and many of those repeated the same shows. The boys spent a lot of time watching Netflix even when cable was available. I am a TV junkie. But I’ve been able to keep up with all of my shows with the exception of the OWN Network. Now that I'm past the withdrawal stage I am living nicely without it. Here’s our current set up. We have two Roku boxes. A Roku HD in the bedroom and the Roku 2XD hooked up to our Vizio HDTV in the den. We currently have Netflix and Hulu Plus subscriptions. I like Hulu Plus because it runs a lot of network shows like Scandal and Nashville which air on ABC. Because I can’t always watch them live, I use Hulu Plus like I would a DVR and watch them later. I also added some private channels to the Roku to add more content such as Nowhere TV which streams our local news (helpful for the bedroom TV which has no antenna) and PLEX, which features A&E, HGTV and ABC Family among others. I added the Twonky Beam app to my iPhone which lets us watch YouTube videos on the Roku via the Twonky channel. And the boys love playing Angry Birds on the Roku 2XD on the big screen. What I like about the Roku is that it has an iPhone app remote so when the boys or the baby misplace the replace Roku remote, all is not lost. I bought a $25 antenna from Radio Shack for the HDTV in the den. Our TV, like most late model HDTVs has a built-in tuner so as soon as the antenna was hooked up, I scanned for channels and was surprised at how many over the air (OTA) channels there are and many are in HD. I checked the Digital TV map to see what kind of coverage I would get before buying the antenna. My mother asked how much I was paying for these channels. I had to chuckle. How quickly we forget that OTA channels have always been free. And there are a lot of good shows on network TV. I received an Apple TV as a birthday gift in July and it’s now the family gift. We all use it as its in the den. It features the standards like Hulu Plus, Netflix & YouTube. They recently added Disney, Smithsonian and Vevo. Hands down, our favorite feature is AirPlay. AirPlay lets you wirelessly stream music, videos, pictures, AirPlay compatible apps and web video on your iPhone or iPad to the HDTV and speakers via Apple TV. Or you can mirror exactly what’s on the iPhone/iPad display to the big screen. The boys downloaded the Nickelodeon and Cartoon Network apps to their iPhone and can watch their favorite shows. I also use AirPlay to watch CNN. (All of these apps are AirPlay compatible) I have to admit that this is where we cheat. We use my mother or sister’s cable subscription log-in information to sign in and watch full episodes with these apps. (with their permission of course). I have a MacBook that I bought back in 2009. While it doesn’t have AirPlay built in like the latest models, I still use it a lot to watch many of my shows. I use a Mini Display Port DVI adapter to connect it to the HDTV (a separate cord is needed for audio for older model MacBooks like mine) and watch shows from websites that show full episodes such as VH1, MTV and TVOne. (There are adapters for PCs as well.) I also use the Rowmote app on my iPhone to control the MacBook from the couch. The Safari browser on my MacBook has a cool plug-in called ClickToPlugin that lets me send website videos via AirPlay to Apple TV. I watch a lot of shows on www.AllShowsDaily.com this way. The selection of shows is great but some videos are not compatible and just won't work. I just got hip to Google Chromecast which looks like it will replace me having to hook up my MacBook up to the TV. The boys watch Netflix, YouTube (mainly Favorites they've saved) and Hulu Plus on the Wii in their bedroom occassionally. They can usually be found watching Netflix on their 3DS when they aren't playing a video game on it. So that’s how we are living without cable. It’s been an adjustment but with a little research & some tweaking, we don’t miss it one bit. ...I'm a serious book piler. I have every intention of reading all the books I have before stacking another book on top. But then I see another book I must have and it gets added to the pile. Right now life is hectic and hurried....and leaves no time for my greatest pastime: having my nose stuck in a book. I'm hoping that will change soon before the pile is stacked too high. Here's what's currently on my nightstand. I'd love to hear what's on your reading list.